April 13, 2019 -- In the state of Ohio, all current sixth-grade students must have the Tetanus, diphtheria, and pertussis (Tdap) booster and the initial dose of the Meningococcal vaccine (MCV4) to enter seventh grade. All current eleventh-grade students need the second dose of the Meningococcal vaccine (MCV4) to enter their senior year. 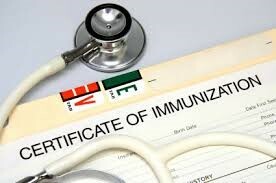 All seventh and eleventh-grade families recently received a letter with information about the required vaccines. For students who still need the immunization, The Cleveland Clinic will have medical personnel at Heights Middle School and Heights High on Tuesday, May 7 to administer the vaccine. Pre-registration is required, enrollment forms must be completed to receive the vaccination on May 7. Completed forms must be returned to the student’s school nurse by April 23. For more information, contact Nurse Rose at Heights High, 216-320-3109 or Nurse Linda at Heights Middle School, 216-320-3519.